This was a message I received on TeaChat, in response to a posting I asked for feedback on this blog. I have posted this same question before, on Steepster, and got great ideas and suggestions! When I posted the same discussion on TeaChat, this was the first response I got. He later messaged me again and said I was being sensitive and that he didn’t mean to offend me. 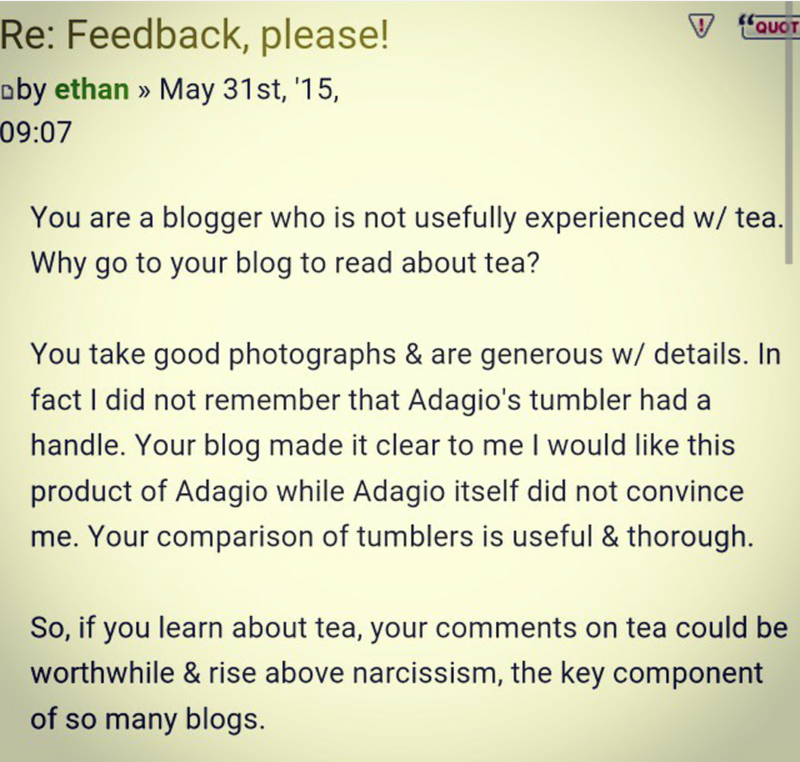 He said blogging was narcissistic and that he didn’t respect Teavana (which, if he had read anything of mine, neither do I). A couple of other people commented on the thread that I just wasn’t posting the teas they wanted to see…they wanted loose leaf teas and not a lot of them like flavored or blended teas (again, me either). I am not a Tea Master, Sommelier or Tea Expert. I am an enthusiast and tend to find that I know more than the average person. I am not writing this blog so that I can rival with editorials, magazines or experts in the field. I am sharing what I know and what I am learning along the way. I post reviews so that you can make a more informed decision on what you buy. You will also see information on Depression and IBS. This blog isn’t meant as a reference for expert information. It is meant as a resource for information that I was always looking for and couldn’t find on my own. This is for people who want to learn more about teas and maybe about Depression and IBS here and there. PS. You don’t have to read it, if you don’t like it. But, if you like it and just think it needs tweaking, I’m always open to suggestions. My email is julie@juliejones.me. I’ve been blogging about tea since 2007 and have definitely hit moments like this. It feels lousy. In the end, your blog is your own, your own personal story. While of course you want to be useful to others, it chronicles your journey. Don’t let it get you down. Be true to your voice. It’s always great to find another tea blogger, another unique perspective. Although to be honest, if I see a teab*g pictured, I tend to not bother. Unless it’s on fire or being trampled or such. Lol I can relate! I just feel like: yes, he might have a communication problem. But whether his intent was malicious or not, the words he used weren’t fair. Especially considering he obviously didn’t read much of the blog. I mention, on multiple occasions, how I dislike Teavana and he seemed to think. I was happy with them. I just think that to make the comment he did, he should have read better… AND communicated better. Yep, welcome to TeaChat. Took me 3 years to get an account there. I think all the weird flavored tea reviews + cutesy tea owl ways must of offended someone there. Now that I have an account, I’ve been treading lightly. I think the nicer crowd is over on Steepster. Everyone on Steepster Chatzy Chat is very nice too! TeaChat and Reddit has concentration of tea snobs (with reddit having an awkward balance of really new tea drinkers too). Know your audience, but also you will also get jerks time to time, just keep doing what inspires you, yo. I could see how that wouldn’t seem like constructive criticism, but you might try to take it for what it’s worth, probably as a failed attempt at that. There is room for people with different experiences and perspectives on tea sharing different aspects of those, and no reason to worry about one person thinking you don’t have the experience they require in a tea blogger. Your blog is nice, well presented, offered for what it is, as one relatively informed person’s experiences. I wouldn’t judge a forum based on what one person comments, but then I’ve recently cycled back to checking out TeaChat and haven’t had much luck with it for interesting discussion either. It’s an issue with a lot of different discussion groups. People seem to tend to be on their own page, and to favor discussion related to people they have already connected with in real life, which is understandable. Thank you! I suppose, I’m just used to Steepster and expected something different. Has I known any of that was the caseI wouldn’t have posted there, I would have just looked around. I’m not saying the entire community is bad or that even this guy is a bad person. I just don’t think there is enough room for negativity like that. I wanted feedback on things they want to see and how I can improve, not someone to question why anyone would value my opinion and then later come back and call me. sensitive. Whether I forgive the communication and delivery or not, it was negative. But, now seeing that it happens often and is almost a right of passage, it doesn’t bother me. A more specific rite of passage is having one particular tea enthusiast hate you for something that doesn’t make sense. I don’t want to criticize her or ruin the novelty of the experience for you though. Just keep networking, and appreciate that in general people that are into tea are nicer than the typical online unwashed masses.